Me, Jon, and Tim, ice axes in hand. I'm incredibly grateful to have been with this team and have that axe. This post is the fourth part of a five part story about Mount Whitney. If you haven’t read the previous installments you can find them here. I leaned against a log in front of the fire as Tim boiled water for dehydrated meals. Jon experimented with melting snow for water and we all talked. The couple we met earlier in the day had already turned in for the night, so it was just the three of us. Inevitably, conversation turned to the lost hiker. Did she slip and fall, only to slide into the waterfall? I shuddered a bit; I had learned how easily one can lose their footing, and how difficult it can be to self-arrest. We had also seen just how easily one could approach that waterfall from above. Then, in the waning light, Jon pointed upward and said, “there’s someone up there now.” A man in an orange coat walked around the waterfall, getting closer than we would have dared. “I suppose we should keep an eye on him,” I said, not knowing what we would be able to do if he did fall in. He didn’t fall in though. Instead, he eventually came down to our campsite and asked if we had seen a woman’s backpack near the waterfall. He introduced himself as Matt, a Search and Rescue volunteer. We told him what we had seen, and how the pack was gone when we came back down. He figured that one of the other campers in the area must have taken possession of the bag, and that he would make the rounds in the morning. Warmed by the fire, we had a pretty great view! “You’re welcome to join us and warm up by the fire,” Tim offered. Matt knelt down next to us, and we made him some coffee. We made introductions, and exchanged pleasantries, but talk soon returned to the missing hiker. How could it not? That’s when we learned more about the situation. Cindy didn’t start the hike alone, but rather as a member of a three person party. With a goal to summit, they had started out at 2:00 a.m. on May 21st, but at some point in the hike, one woman decided to head back, leaving Cindy and a male companion to continue on. 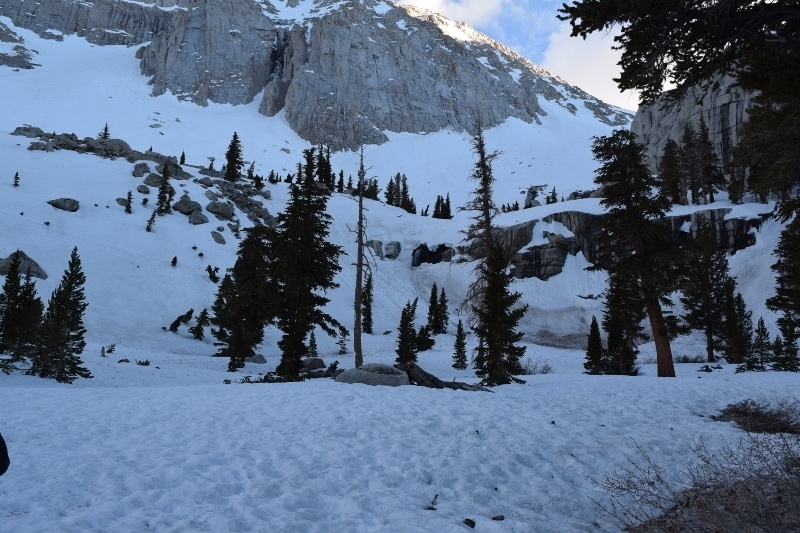 They made it to Trail Crest, at 13,650 feet, and the male hiker decided to make an attempt at the remaining two and a half miles and 855 feet of elevation to the summit. Cindy, the missing hiker, decided to turn back. The male hiker did reach the summit, and began the long trek back to the trailhead. When he arrived, he was unable to locate his companion. Someone notified the Inyo County Sheriff’s dispatch around 9:00 am on the 22nd, and that got the ball rolling. 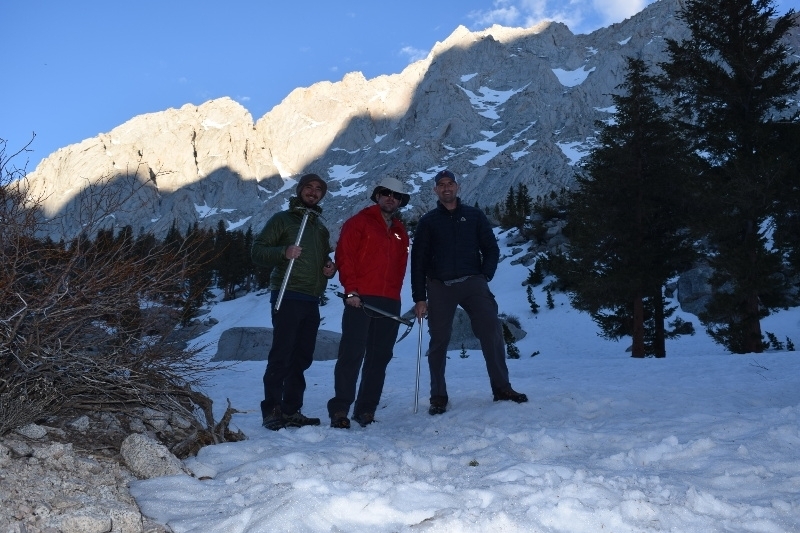 The call for volunteers went out, and that brought search and rescue, including Matt, to Mount Whitney that day. Matt telling us about his experiences doing Search and Rescue. “People who saw her thought she was acting strangely,” Matt told us. “It sounds like she had altitude sickness and wasn’t thinking clearly.” I nodded, thinking of all the reading I had done about altitude sickness before coming on this trip. I’m a flatlander, a midwesterner, and the highest natural point in my home state is a hill in northern Illinois named Charles Mound. It’s a whopping 1,235 ft above sea level. I had some anxiety about the possibility of suffering altitude sickness, so I had done some research. Altitude Sickness, or Acute Mountain Sickness is caused by getting less oxygen per breath at altitude. To make up for this you have to breathe faster and more deeply to get the same amount of oxygen you could by just breathing normally at lower elevations. The first and most common symptom is breathlessness and an elevated heart rate. After that, one might experience nausea, headache, and dizziness. If these symptoms get worse, you should probably consider heading back down to a lower elevation. Another symptom that some people suffer is a decline in cognitive function, especially at 13,000 feet and above. Matt said he’s seen it before on Search and Rescue runs. It’s easy to say that the missing hiker and her partner shouldn’t have split up. 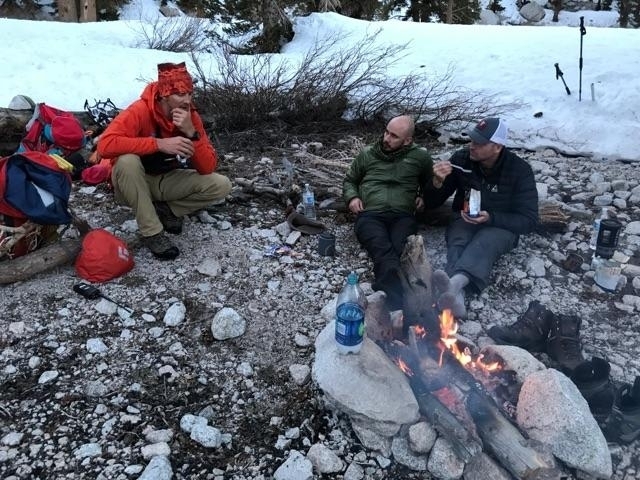 They shouldn’t have, of course, but considering they had parted ways at Trail Crest, which sits at about 13,650 feet, it is entirely possible that they had been impaired when they made the decision. I’m not saying that with any degree of certainty, I’m simply suggesting that while it might be easy to judge their decisions, it is feasible that the altitude, especially when paired with fatigue, hunger, disorientation, and potential dehydration, could have had a deleterious effect on their judgment when they made this decision. A decision that would end in tragedy. “I’m pretty sure she fell into that waterfall,” Matt told us when we pressed for his thoughts on what had happened. “I can’t safely get close enough to look down in there to verify, but if I had to place a bet, I’d say she’s at the bottom underneath all the snow.” He explained how the path that we had taken up around the fall is only a path in the snow; in the summer, it’s actually more of a sheer wall. The waterfall is mostly snowmelt, and as it flowed it created an ice cave approximately sixty feet below it, underneath the mound of snow that we hiked up. “Tomorrow we’ll have a Chanook helicopter fly in with some specialized Search and Rescue guys. Probably in dry suits so they can get down in there and verify. But I’m pretty sure that’s where she’s at.” Matt looked a little pained as he explained all this. You could tell that this situation troubled him; it’s obvious he loves the mountain, so it pains him that he has to be up there for these kinds of reasons. But it’s his love of the mountain, and his experience on it, that make him so qualified for such a task. Search and Rescue can’t be an easy thing, and there’s a lot of sacrifice involved in what he’s doing. He could be home with his wife and young child, but instead he spent his day on this mountain, exploring precarious spots, in the hope that he could find a lost hiker. I would say there’s something heroic about that, and he would undoubtedly argue that there isn’t. We shifted the conversation to more pleasant outdoor adventures, and Matt shared some interesting Search and Rescue experiences with us. 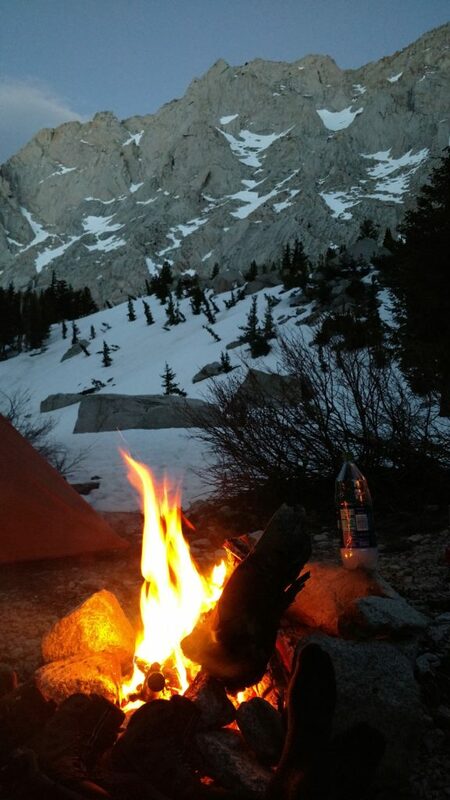 After a few hours of swapping stories around the fire, Matt left to go set up his bivy. Tim, Jon, and I sat around watching the wood burn for a bit longer. The night air felt cold, but not uncomfortable, and stars filled the sky. We let the fire burn down, cleaned up camp, and then turned in for the night. The three of us tucked into a two-man tent were plenty warm. I left my sleeping bag open, and was perfectly comfortable breathing the cool night air from the open tent flap. On my left, Tim passed out almost instantly. On my right Jon seemed restless. I felt restless too. As I listened to the waterfall, normally a relaxing sound, several emotions swept over me. Since returning home I’ve mentioned this to several people and most have replied with some variation of, “Well of course, you thought you were sleeping 100 meters away from a deceased hiker.” While that’s factually correct, it’s also incomplete. I felt ambivalent. Uncertain. Conflicted. Despite the struggles, I was having a wonderful time. Though I had come close to danger and perhaps pushed myself a little too far, I had met the challenges and even savored them. I enjoyed my time that day with Tim and Jon, I had great fun meeting and getting to know Andrew and Matt. As I lay in the tent I struggled to make these two very different stories make sense in light of one another; mine was a narrative of freedom and excitement, while Cindy’s was a sad and tragic tale. Perhaps I even felt a little guilt for having as such a good a time while the mountain extracted suffering from others. It might sound odd, but I also began feeling grateful. I was grateful to be on the mountain. Grateful for friends like Tim that would support, or even suggest, a team bail out when it wasn’t safe. Friends that wouldn’t leave a team member alone. I was grateful to get to know Jon, to meet Andrew and Matt. I wanted to call my wife and let her know I was grateful for her as well, though I knew there wasn’t any signal up on the mountain. But I sent my gratefulness out to the universe, as well as my sympathy to Cindy and her family. Amidst these kaleidoscoping emotions- happiness mixed with sadness, excitement mixed with anxiety, compassion mixed with gratefulness- I drifted into slumber.